Supporting worthy causes has always been a community effort here at Blue Bottle. After hosting a contest among the brilliant, heartfelt craftspeople we're delighted to call Blue Bottlers, we knew this design—dreamed up by South Park Barista Adrina Goglanian—was the perfect one to represent us on our Pride T-Shirt for 2018. (Have no fear, mini-Blue Bottlers, it comes as a baby onesie, too!). We see ourselves as responsible for the neighborhoods, from Tokyo to Miami, in which we we're so lucky to share beautiful coffee experiences. With your help, we’ve given back to dozens of local organizations, and we intend to do even more as we continue to grow. 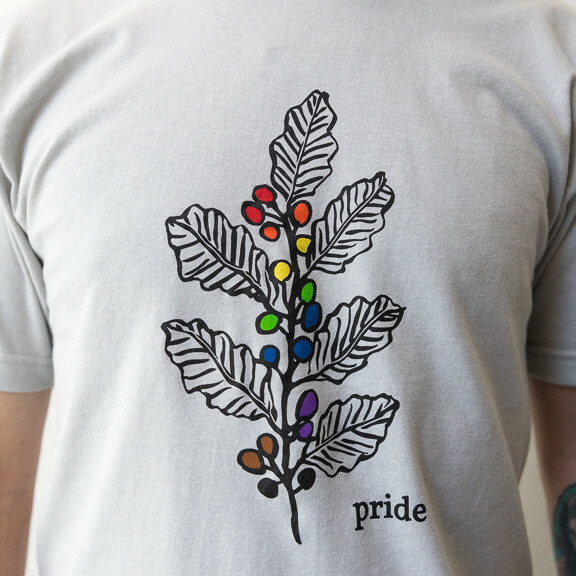 Proceeds from the sale of this Pride T-Shirt will go to our community giving program, the Blue Bottle Coffee Foundation, which supports causes that uphold our values of deliciousness, hospitality, and sustainability.